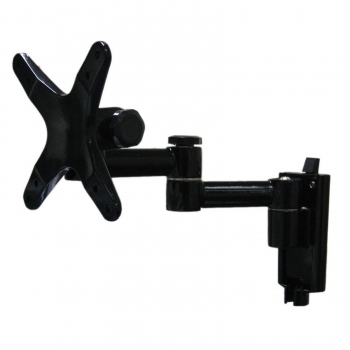 Features: Arrowmounts Cantilever Wallmount for Lcd Tvs up to 30-Inch. Two piece -Inchslide-in-Inch installation for easy mounting. Aluminum die casting construction and painting finish. Adjustment knob and geared joints for effortless operation. Extension size: from 3.0 inch to 10.0 inch. Tilts 20° upward and 20° downward. Swivel 180° angle. Includes installation guide and hardware kit. Extension dimension from the wall of 10.0 inch. Rigid extrude aluminum construction and anodized finish. Fits most screen up to 27” with Vesa 75/100 mount pattern.